SupportPal automatically converts support requests from various support channels into tickets and presents them all in a single grid. Filters can be applied to list tickets with certain details or features, and tickets can be given tags. Users can submit tickets through the web interface, where you can define custom fields that the user may need or wish to fill out. Emails submitted by users are directly converted into tickets, with a different email address used for each department. Further replies by the user are added to the same ticket. Utilise the API to open and reply to tickets through code. The comprehensive REST API will let you easily use the help desk functionality in your other software. Tweets directed to your Twitter handle are converted to support tickets, with support for multiple accounts. SupportPal lets you reply with a public directed tweet or a direct message to the user. Messages posted on your Facebook page wall and to your account are converted to support tickets, with support for multiple pages. SupportPal lets you reply directly to the wall post or message. We understand that customer support should be quick and efficient. Most actions only require a couple of clicks and can be performed without needing to reload the page, speeding up your workflow. Staff can easily communicate with each other via private ticket notes and internal messages. Operators will be able to track which tickets are being viewed and responded to by others, as well as assigning tickets to the right department and team members. Use ticket custom fields to collect additional information which may be relevant or required. Sensitive data, such as passwords, can be encrypted. The data can also be purged automatically once the ticket has closed, if it is no longer required. With service level agreement (SLA) plans, you can define first response and resolution times for tickets. Ticket due times are automatically calculated based on your business hours, or can be manually set if no SLA plan applies. Due times can be paused or removed as needed. If you have multiple companies or brands, each can be configured in a single SupportPal installation. This simplifies access and management for staff by bringing all support requests into a single place. Licenses come with one brand by default, additional brands must be purchased separately. Each brand can have its own personalised support portal, with a customisable logo, colour scheme and template, and comes with a unique self-service area. Your users won't know that the brands are connected together. Operators can be assigned to specific brands, making it easy to control who can access what. Departments and custom fields can also be assigned to brands, so each support portal can be tailored to fit the needs of the given brand. Create personalised email templates for each brand, allowing you to include information pertaining to that brand only. Operators can also create context-specific ticket signatures, so a different signature can be used for each brand when replying. Seamlessly support your customers in their own language with our simple language file system. It's easy to create translations for terms used in the system and disable languages you do not require. Write translations for your own text; such as your department names, self-service articles and email templates; and the correct version will be shown to the user based on their selected language. Escalation rules can be set up on SLA plans to handle tickets that are or will become overdue soon. For example, you may want to assign a specific member of staff or add an automated response. Often you may need to follow up with a user at a later date. Ticket follow ups enable you to schedule actions that should automatically occur on a ticket at some point in the future. If there are a set of actions that are commonly used on your tickets, they can be grouped together in a macro to simplify the process. Macros can be applied manually to tickets or automatically, if the ticket matches the conditions set or on a ticket hook event. Often users will ask similar questions or make the same requests. Canned responses enable you to store common ticket replies and access them when responding to future tickets. They can be private to yourself or made available to all staff. Your users may often be different people within the same organisation. Create and manage organisations, allowing you to keep contact details and notes for the particular organisation. Organisations can also be directly managed by your users themselves. Organisations have two access levels: managers and users. Managers can view and reply to tickets opened by all in the organisation, whereas users can only view their own tickets. Managers can manage the users in the organisation. Access the tickets submitted in the past by individual users and whole organisations, through any support channel. It can be useful in aiding with future support requests. You may have users who fall under a certain category. SupportPal lets you group them together, allowing you to set a specific SLA plan for that user group or build mailing lists. SupportPal allows you to create content rich self-service articles. For example, you may wish to embed video or images to better illustrate how to resolve a problem. Create and modify self-service sections, such as knowledgebases and announcements, as you require, with a number of options available depending on the content and how you wish for it to be displayed. Internal self-service areas can also be set up for operators. A multi-level user commenting system exists for all self-service articles. 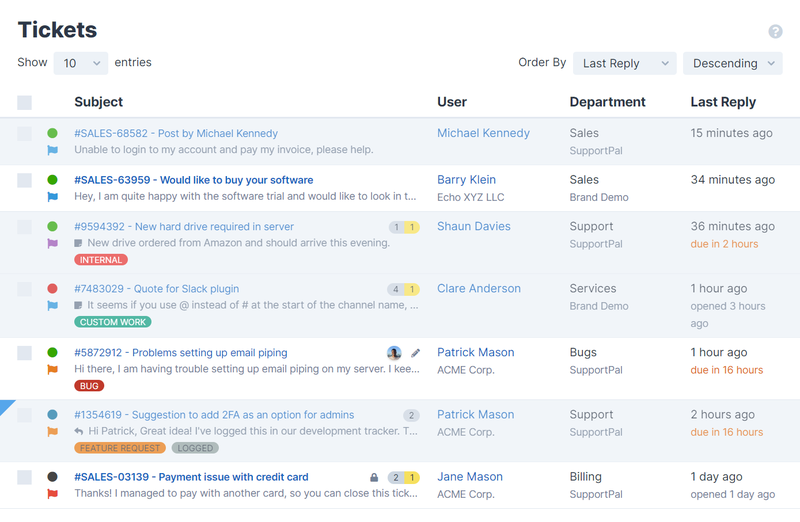 Comments can be moderated for approval before being displayed publicly on your help desk frontend. It's important to know how your users feel about your service. Design your own feedback forms to send to users on tickets of your selection. Collect and analyse the feedback with our customer satisfaction view. The help desk data is used to generate useful reports. You can find out more about how your help desk is performing overall, how well individual members of team are operating and more details about your users. Our reports framework means you can easily build your own reports too. Our simple branding system allows you to easily adjust the logo and colours of your help desk per brand. Our interface template system lets you go further and customise the whole template, allowing you to integrate the help desk around your web site design. Leverage our extensive plugin system to create your own additional functionality or modify data being handled by the system. For more details please read our documentation. Easily integrate your existing systems using our comprehensive REST API. For more details please read our documentation. Fetch client product information from Blesta in the ticket view, and more. Get notifications of selected ticket actions in your HipChat room. Get notifications of selected ticket actions in your Slack channel. Track and log time spent by operators on tickets with our very own plugin. Fetch client product information from WHMCS in the ticket view, and more. Fetch user orders and subscriptions from your WooCommerce system. Replace Blesta support functionality with SupportPal features and sync user details. Connect operator accounts with LDAP accounts, allowing them to login with their LDAP account details. Connect user & operator accounts with SAML accounts, to provide single sign on (SSO) authentication. Powerful one-click time tracking for the whole team on your help desk, with custom reports and insights. Replace WHMCS support functionality with SupportPal features, syncs user details and provides a loginshare.